Vancouver was once considered the best city to live in the world, and it’s not hard to see why. The city itself is beautiful and wealthy. But that’s not all the city has to offer. The furnished apartments in Vancouver central and the outer suburbs provide a great base for the surrounding countryside – an epic adventure land for adrenaline junkies. To the East of Vancouver are thousands of miles of mountainous terrain including, of course, the Blackcomb Mountain. The mountain itself is more than 6000 feet tall, making it one of the highest in the area. Not only that, but it’s also home to one of Canada’s highest restaurants, the Crystal Hut which serves up baked dinners to tired hikers near the summit. The views from the top of the mountain are pretty spectacular, and if you do make the climb, you’ll be treated to a panoramic backdrop of breathtaking natural beauty. Another favorite spot in the backcountry beyond Vancouver is the kitesurfing destination at The Spit in Squamish. To get to the Spit, you’ll have to take on some of Canada’s most rugged dirt and gravel roads, but once you get there, it’s totally worth it. Although it’s inland, the lake has a sort of beach vibe: it’s laid back, and it’s all about people letting their hair down and having fun. It’s arguable a better experience than going to the beach, however, thanks to the stunning views and the tranquil waters of the lake. If you go along at the right time, you can catch a glimpse of surfing competitions and watch the pros compete to be the best kite surfers in all of North America. Squamish is home to a beautiful lake, but it’s also surrounded by mountains, making it a great place to go hiking too. There are dozens of trails which lead off in all directions from the lake and take you right out into the Canadian wilderness. The area is one of outstanding natural beauty, and there is little evidence of human impact on the land. As a result, you get to experience nature in its raw beauty. For animal lovers, it’s a great opportunity to go animal spotting. Here you’re likely to see deer, otters, beavers, all sorts of different kinds of fish as well as the odd bird of prey. The most adventurous hikers will want to heave to the summit of Stawamus Chief. This climb is a lot harder than the climb to the top of Squamish. Another beauty spot outside of the city is Lynn Canyon Park. Thanks to the geological features of the park, it’s home to some stunning lakes and pools. One of them, the 30 Foot Pool, is a great place to take a plunge and cool off on a hot summer’s day. The waters are as clear as they could possibly be, and when the sun reflects off the rock underneath, they take on an azure blue-green tinge that feels oh so tropical. IRAZU VOLCANO and OROSI VALLEY, COSTA RICA: To see the real beauty of Costa Rica, you have to go the lush green mountains, rugged volcanoes, valleys, and rainforests. 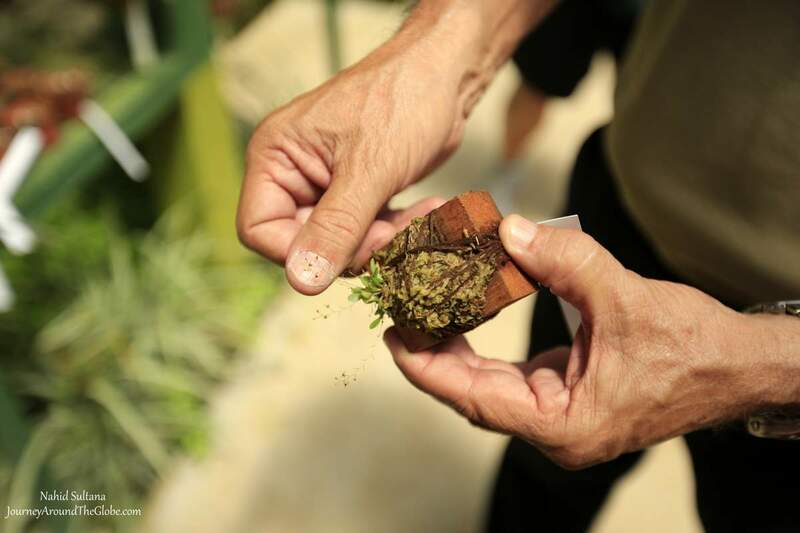 And this trip gave us that taste of real Costa Rica. Aside from the sceneries, I fell in love with Costa Rica more after this trip…thanks to our well-educated guide. The country was founded by the Spaniards in 1523 in Orosi Valley. During that time, this place was inhabited by the indigenous people and the Spanish emperors ruled this country up until 1821. Costa Rica was the first nation in the world who abolished their army permanently in 1949. Now all that money goes to education and that’s why it has the highest literacy rate in whole Latin America. Oh, another interesting fact is that recently Costa Rica was voted to be the happiest nation in the world…such an impressive country overall. The trip to Irazu Volcano and Orosi Valley was an extraordinary experience for us. It took us to some off the bean paths and showed us some unbeatable views of Costa Rica. The trip was booked thru viator.com and we were picked up right from our hotel entrance to start the tour on time. It was a long 8 hours of tour, but very well worth it. TIME of TRAVEL: This was our second day in Costa Rica. 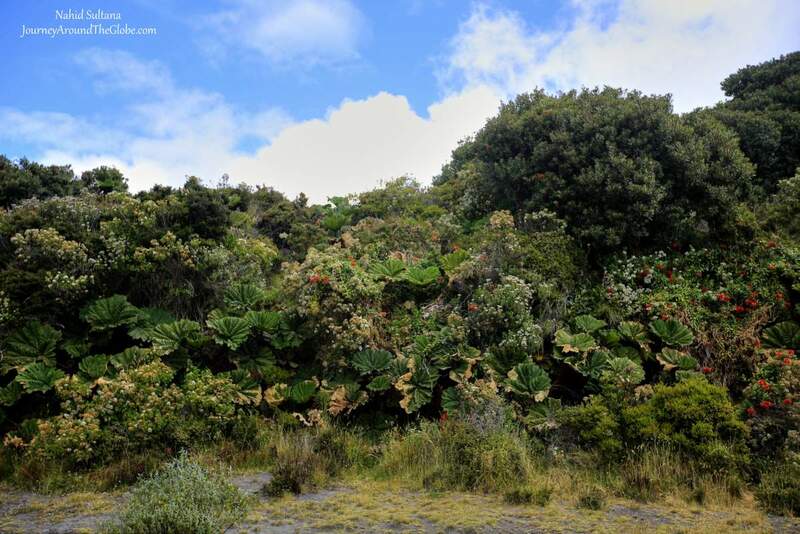 We roamed the capital, San Jose, on the first day and Poas Volcano with La Paz Waterfalls Garden the following day. It was the middle of March, 2015 when we flew to Central America. Before coming to Costa Rica, we visited El Salvador and Panama and from here we were off to Nicaragua. Even in March, it was way too hot and humid. It’s the dry season here. Be sure to bring some sunscreens, hats, sunglasses, comfortable clothes, and walking shoes for this trip. Being a tropical country, they don’t get any snow…so, coming here in winter may not be a bad decision. But keep a close eye, because this region is an earthquake prone zone. OUR HOTEL: Our hotel Radisson was located about 15 minutes’ walk from the downtown San Jose. It had a beautiful swimming pool and hot tub, free traditional and continental breakfast buffet, and free Wi-Fi. 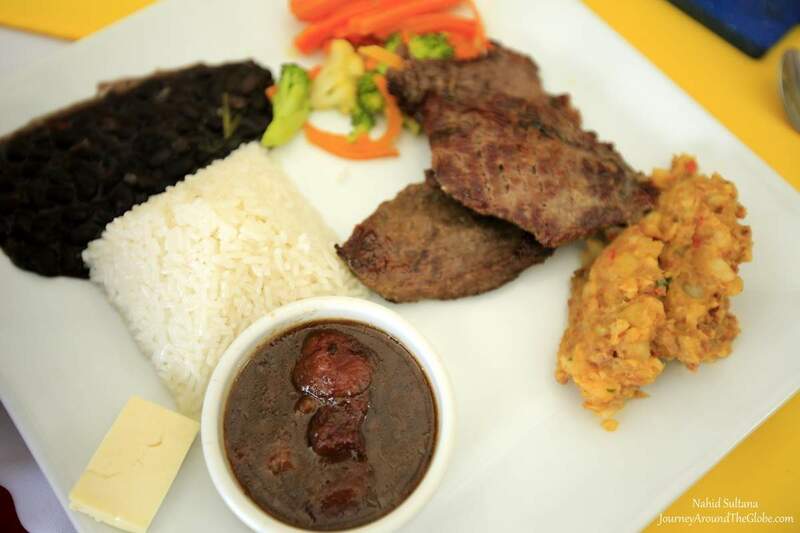 I loved having typical Costa Rican breakfast every morning, which were black bean with rice, local cheese and coffee. EATING and SHOPPING: Since this was a guided trip, after visiting the Lancaster Botanical Garden we were taken towards Orosi Valley for little sightseeing and lunch. The place is called La Casona del Cafetal. Our big group sat outside by a beautiful lake surrounded by a lush exotic garden. We had some rice, beans, and fried plantain with the options of meat or fish. Sea bass and red snapper are some common and popular fishes in Costa Rica. 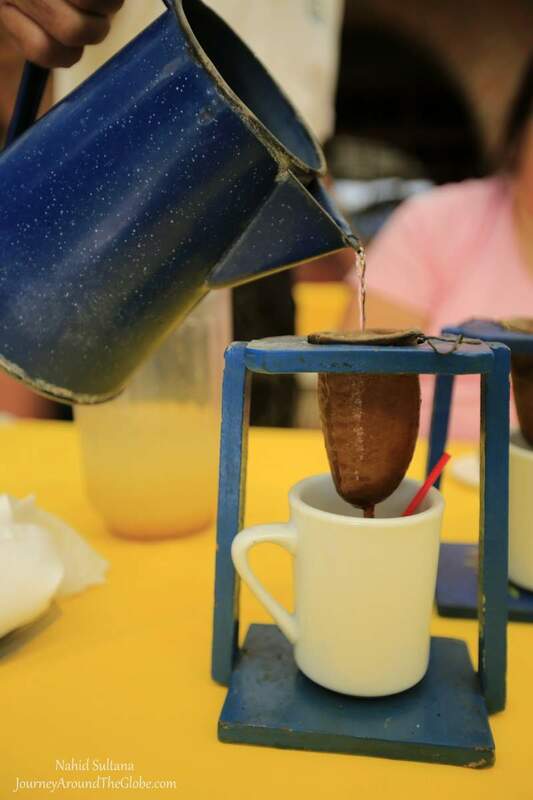 After desert we finished off with some locally brewed fresh coffee…poured in traditional Costa Rican style. Since this was a guide tour, we didn’t have much time to ourselves to go for souvenir hunting. We bought a wooden napkin holder from Irazu Volcano. We stopped few more places along the road for more souvenir hunting but most of them were expensive. PLACES WE’VE VISITED: This was about an 8 hours of guided tour. These are some of the following places we saw with a big group and an experienced guide. 1) IRAZU VOLCANO NATIONAL PARK: About 51 km from San Jose is Costa Rica’s highest active volcano, Irazu Volcano. It is a popular destination spot and a short ride from the capital. 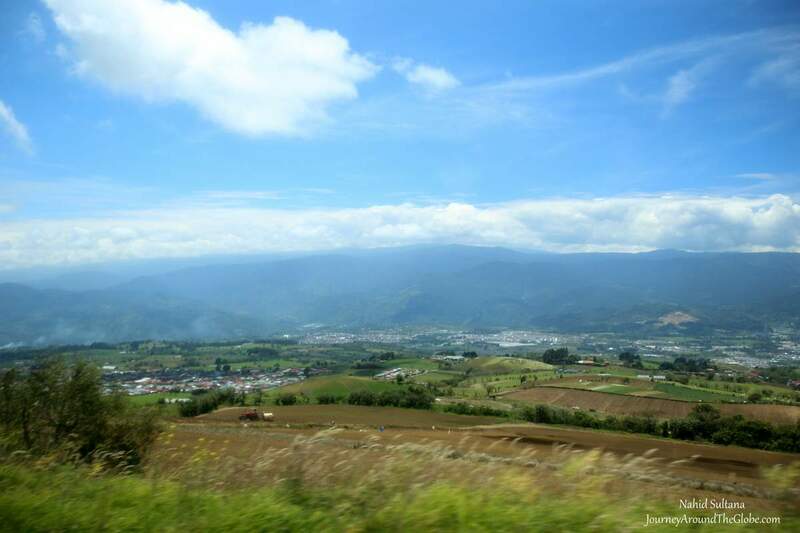 The drive started to get very scenic after we passed thru the city of Cartago. We passed by some villages, farms, open fields, valleys, exotic plants on the road sides, and saw farmers working on carrot, onion, and potato farms. On our way, we stopped at a curb side to see Costa Rica’s most active volcano, Volcano Torrelba, which last erupted in 1860s, but now again was fuming steam. We could actually see the steam from a distance. From here we rode up the zigzag mountainous road and our bus finally stopped at the summit. 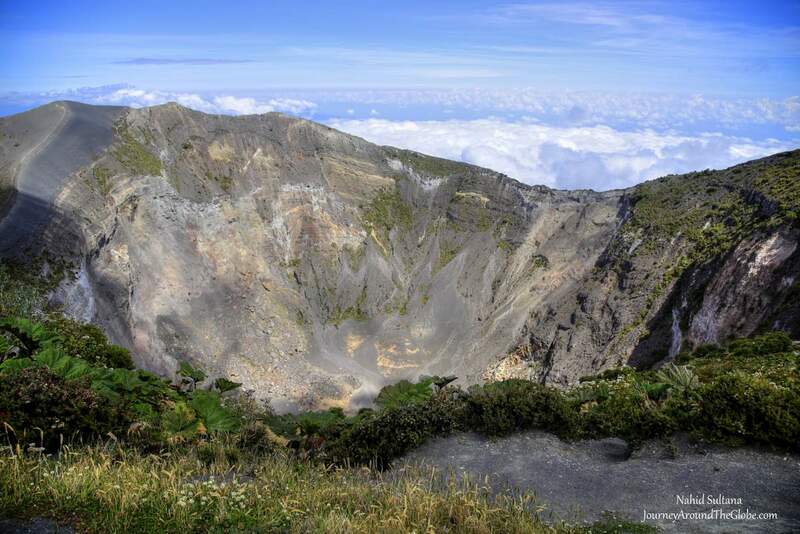 Irazu Volcano has total of 5 craters with various depths and diameters; the two most important ones are the Main Crater and Diego de la Haya Crater. The Main Crater, Crater Principal, is about 300 meters deep and 1050 meters in diameter. This crater used to have a blue lake in the middle but it’s not there anymore. Last major eruption from this place was in 1965. The guide showed different kinds of lava rocks as we walked towards the Main Crater. We saw a humming bird in the small forest on our way back, which tells us this national park is a home to some exotic plants, flowers, animals, and birds. It is better to carry a light sweater for this trip. It can get a bit cold and cloudy from time to time for its high elevation. The park is open from 8 – 3:30pm. Although our entrance fee was paid by the company, it’s $15 per adult and $5 for each kid. We spent about little more than an hour in the park, taking leisure stroll on one of the dead craters. Visitors are allowed to take different trails and hike around the different craters if time permits. At the end of the tour, visit the souvenir shop. The items were of course a bit expensive, but had lots of unique things to purchase as gifts or memories. 2) OUR LADY of ANGELS BASILICA in CARTAGO: About 31 km from Irazu Volcano, beside San Jose, is another city, called Cartago. This is Costa Rica’s first capital. Our bus stopped in front of a Byzantine style big church, Our Lady of Angels Basilica…we were at our second stop. Outside the basilica is very monumental, but standing here we couldn’t imagine the fabulous and majestic beauty that it holds inside. 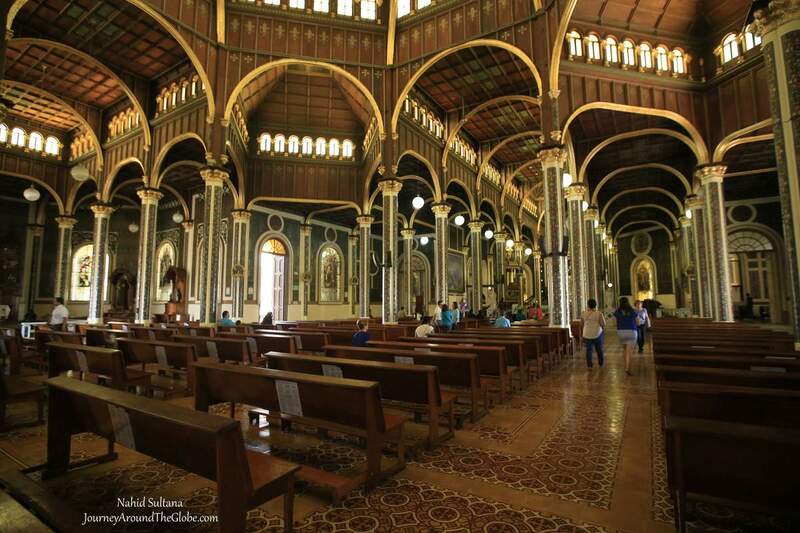 From its elegant altar to illustrious wall designs, over-sized paintings, splendid dome, wood carvings, artistic columns and floors, and stunning stained-glass windows…this Catholic church from the Spanish time is a jewel in whole Costa Rica. 3) LANKESTER BOTANICAL GARDEN: Lancaster from England donated this exotic, one of a kind garden to the University of Costa Rica outside of Cartago in 1973. It is open to the publics but operated by the university as a research center. The garden is considered as one of the most beautiful gardens in Latin America. 15 minutes of drive from the basilica, this was our last destination before lunch. Lankester Botanical Garden has a world-class collection of different species of cacti, bromeliads, and other tropical flowers. 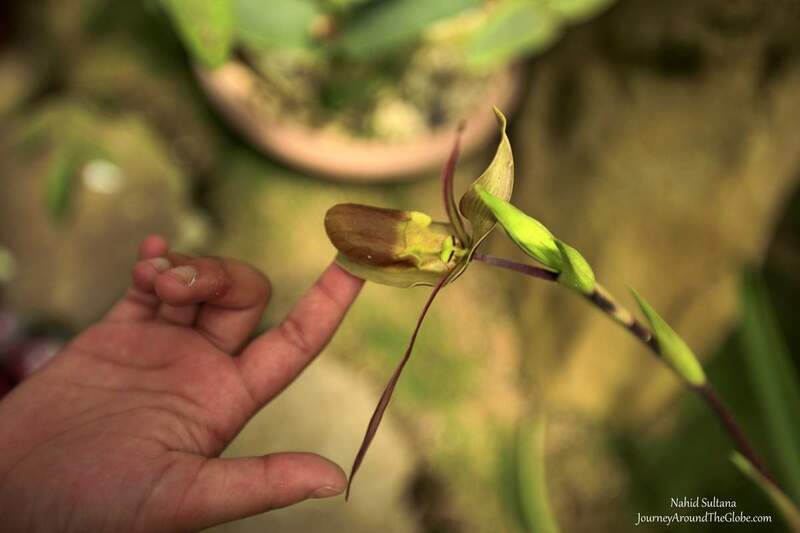 Exhibition of orchids is the center attention of this garden and visitors can see many varieties of orchid which are not easily seen in the wild. While strolling around the garden, enjoy the small fountains, exotic plants, trails, ant colonies (yay…we saw some armies of ants carrying leaves), a small portion of Japanese garden, and bamboo trees. 4) OROSI VALLEY: Our lunch spot and last destination of the day was Orosi Valley. This is one of the oldest communities of Costa Rica and a beautiful one too. Orosi Valley was founded by the Spaniards in 1563. Its deep valley is surrounded by small hills, volcanoes, rainforest, and lush vegetation. While many fruit and vegetable farms are plenty here, coffee is the leading industry in this area which was first brought here from Cuba. Many of the coffee plantations from this region supply their famous Costa Rican coffee beans to Europe and other continents in the world. They also export bananas and pineapple to other countries, large part of which are grown in Orosi Valley. 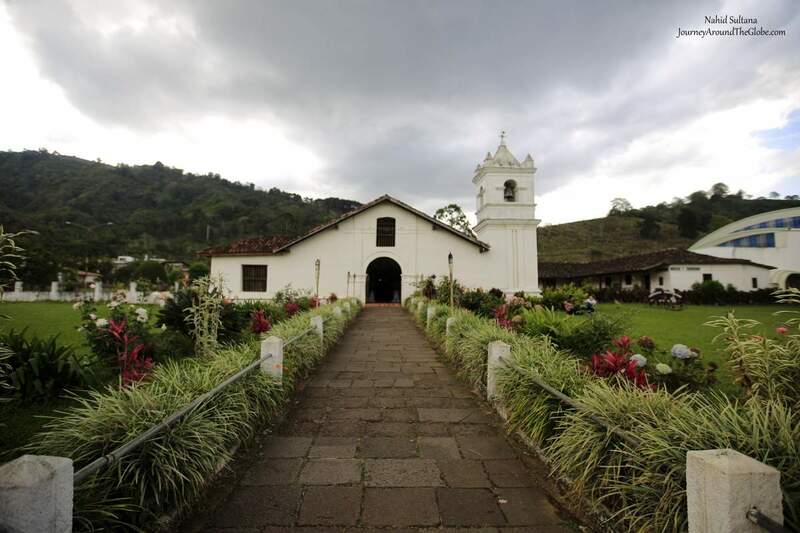 Orosi Valley houses the oldest Catholic church (that is still in use) in Costa Rica, Iglesia de San Jose. The church is from 1743 during the colonial time after its patron saint San Joseph. The church as destroyed in earthquake before. What you see inside the church is 60% of the original structure. It is simple but a historic church in this region. 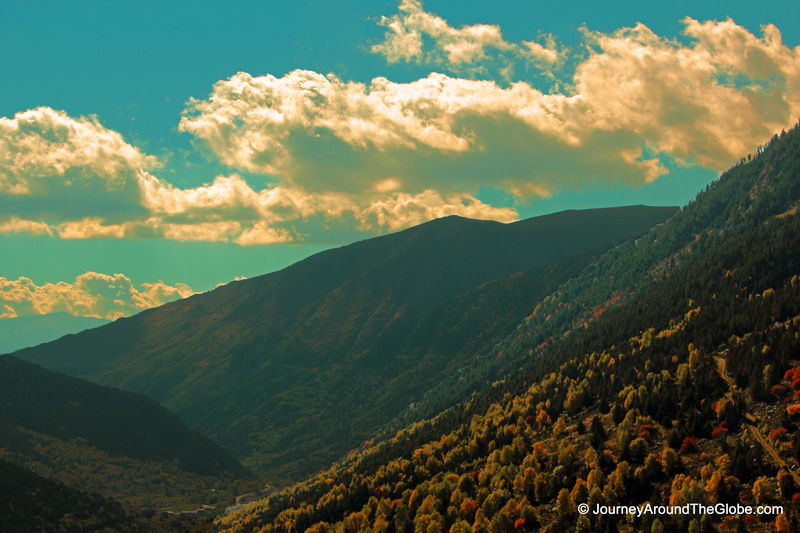 I took this picture while we were driving thru Pyrenees Mountain range in French side. You can already see some change of colors in nature, but I am sure it will look even more beautiful when all the trees get their fall colors.